Willow’s chimney had always had a bit of a leak. I sealed it up last year, but it had started to come through again, so we needed to get it sorted before we started using it again this winter. Our first attempt at resealing it wasn’t successful – it still dripped. 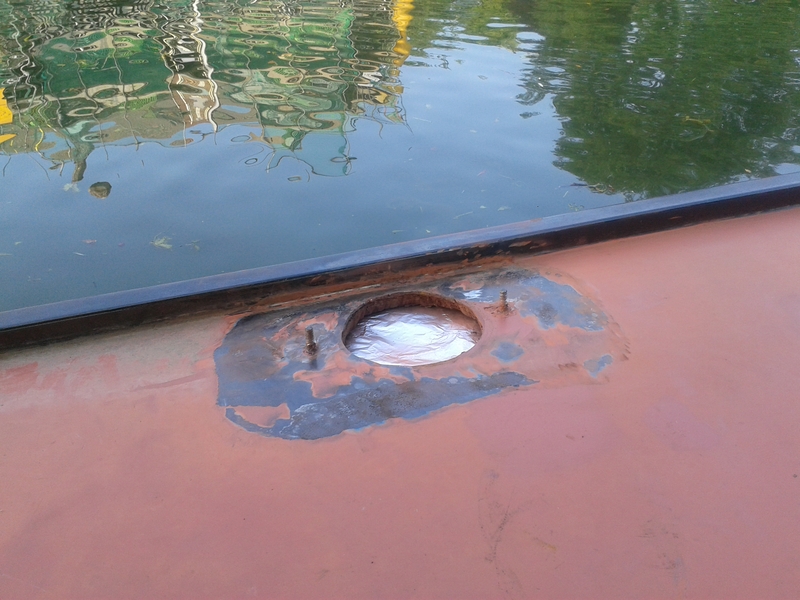 So off it came again, and this time as well as the sealant between cabin top and collar we sandwiched a layer of closed cell foam along the critical edges to seal up gaps caused by the irregular surfaces. Then I put several layers of sealant around the edges, leaving a gap between the collar and the handrail so water doesn’t collect. 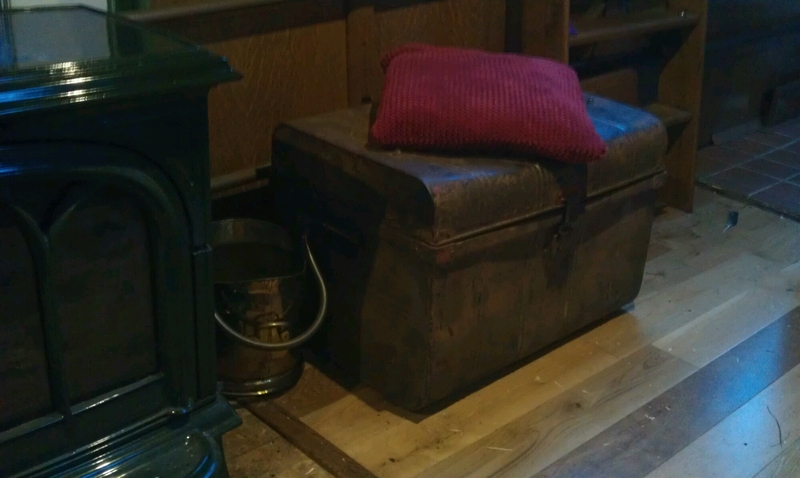 Last night it bucketed down and it was completely dry inside this morning so I think we may have sorted it (for now!). Next job is a ring of high temp sealant on the internal joint which leaked tar last winter, and a touch up of the beautiful green enamel of the stove itself, as well as resealing of the collar between the flue and the stove. 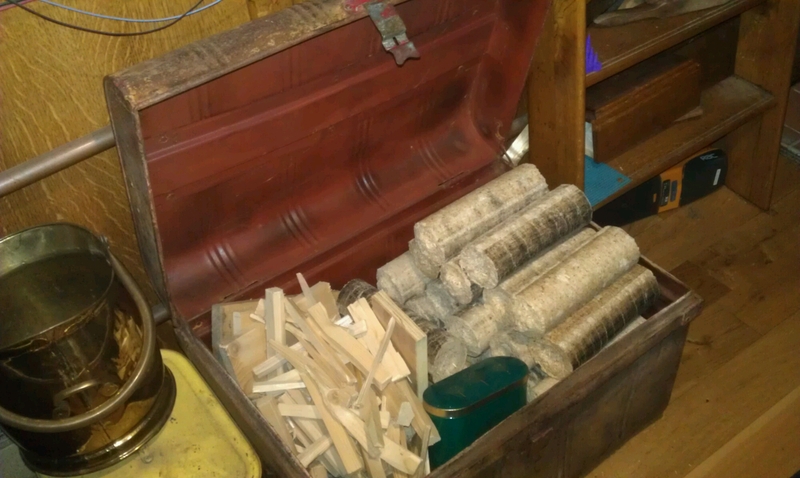 Hopefully all in time for the winter’s first fire! 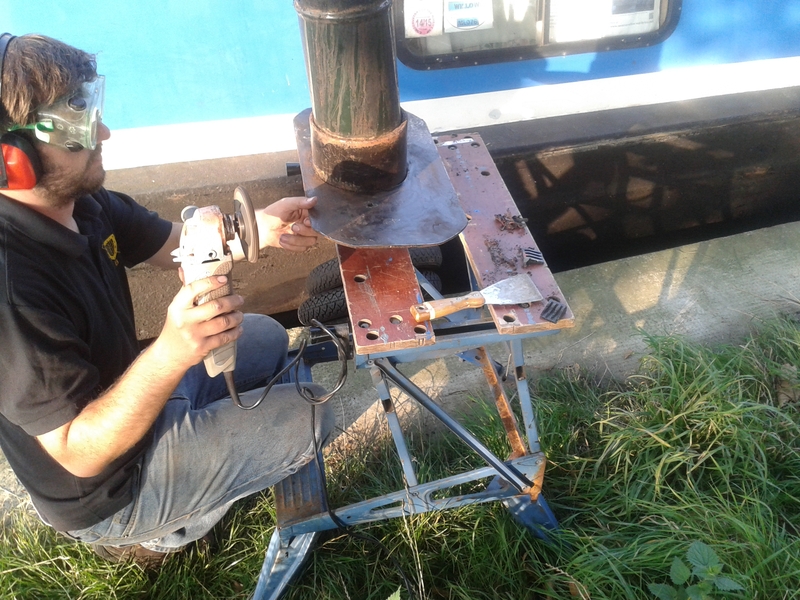 P.S Apologies to the friendly blog readers who approached me whilst I was on the cabin top with sealant gun in hand, unable to say hi properly! Do come back another time! 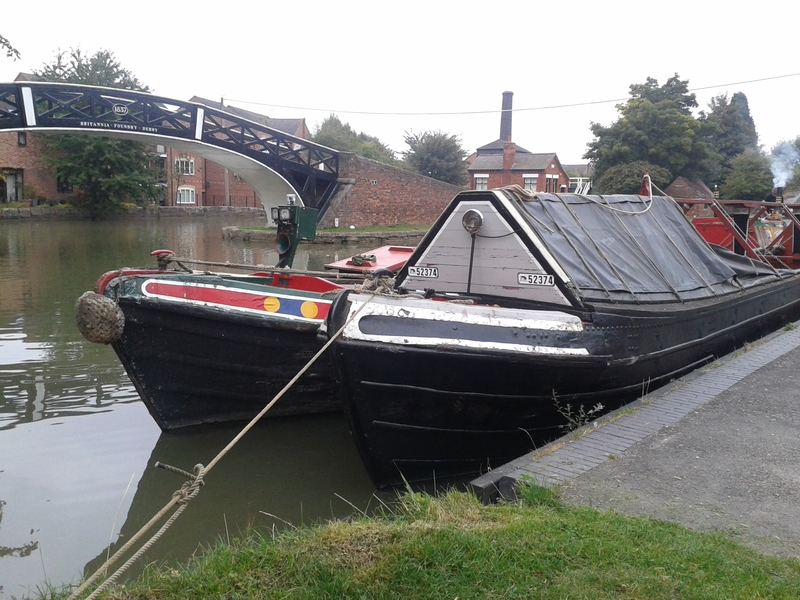 Our friends Jason and Charlotte recently bought an old boat to live on: a beautiful unconverted small Woolwich butty, Betelgeuse. 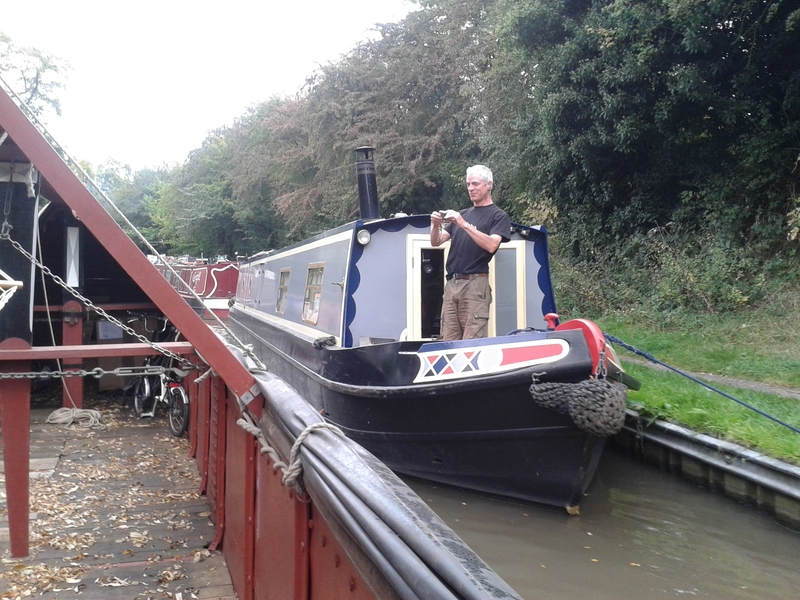 Jason is also an owner of the wooden Claytons tarboat Spey so that was the obvious choice to tow the butty from Braunston to Stone where they will be based. They invited us to join them for part of the trip, and we readily agreed! Boating with a pair of old boats is even more fun than boating with one! We drove to Nuneaton railway station and got a taxi to the Greyhound at Sutton Stop, having visited ASDA in Nuneaton for supplies. We arrived at the exact same moment they did – we could hear Spey‘s distinctive single cylinder Bolinder as we approached! Time for a few drinks at the Greyhound before bed – we were sleeping on the cross bed in Spey‘s forward tar tank, which is surprisingly cosy! 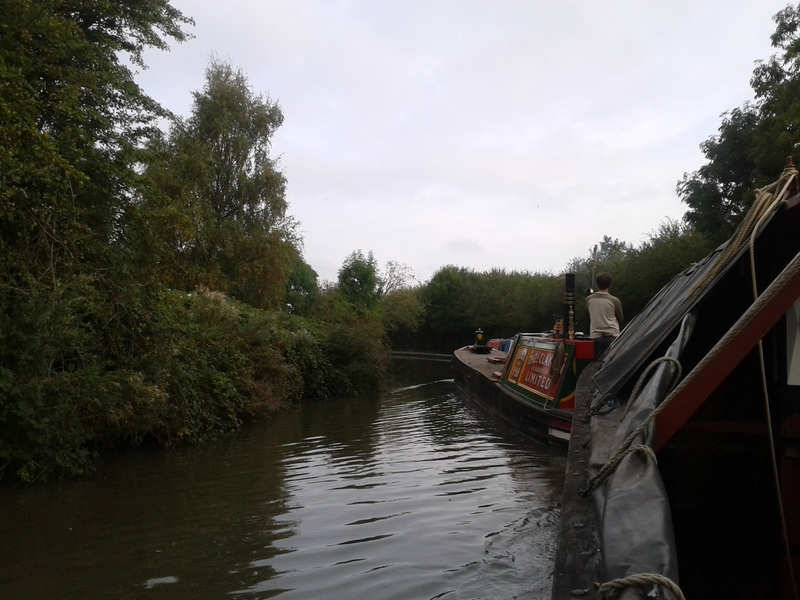 Next morning we set off up the Coventry canal, the butty on cross straps. 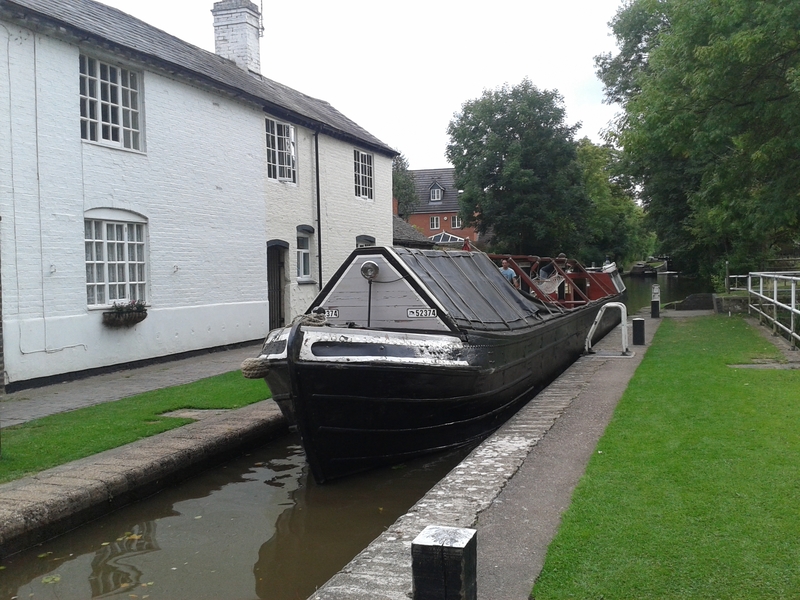 At Bedworth we passed fellow bloggers Halfie and Jan on Jubilee, who took some photos. 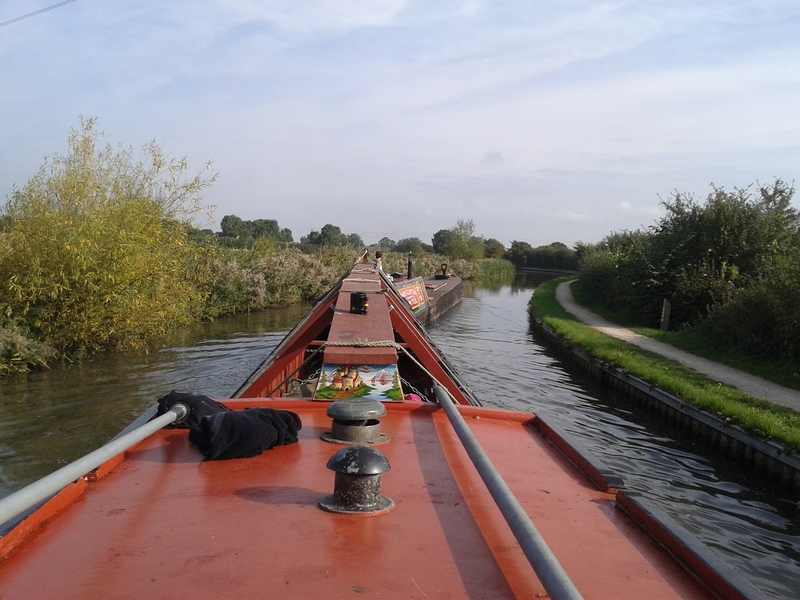 James did a fair bit of motor steering, and I took the butty helm – it took some getting used to but it was a new and exciting experience for me. 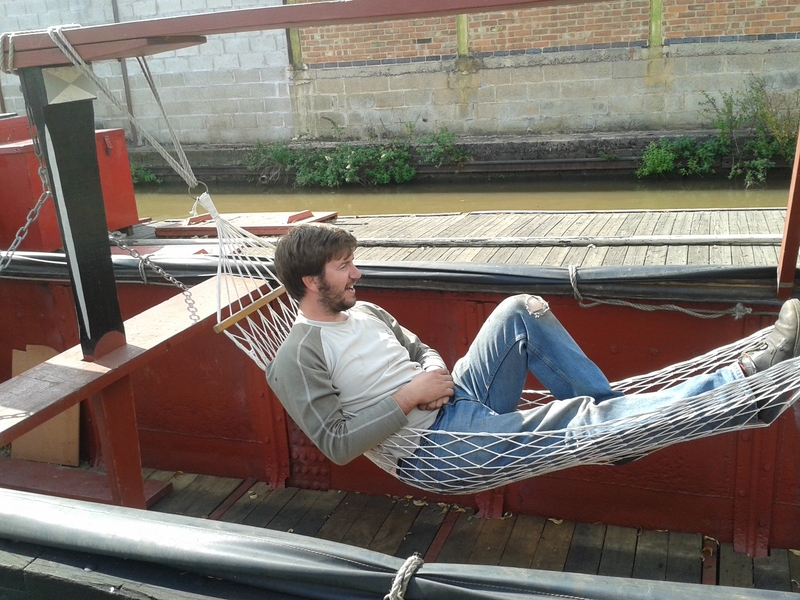 We’d set up a couple of hammocks in Betelgeuse‘s hold, which were a great place to relax and watch the canal pass by. Down the Atherstone flight, I helped the motor with Mac, another Spey owner, steering and the others bowhauled Betelgeuse down the flight. 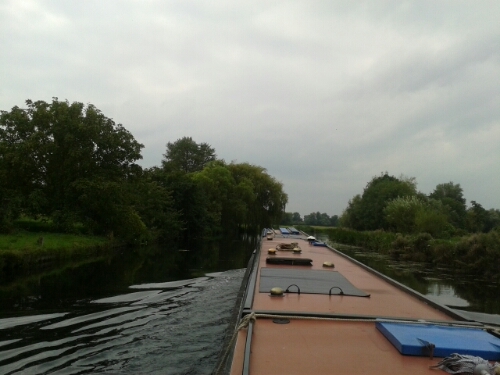 In the long pounds we waited to tow the butty, whilst I set ahead. We stopped at the Samuel Barlow for the night, breasted up to Tench and Ilford. Late that night Tom also joined us, and as we had a shorter day to Fradley the next day we set off after breakfast. When we got to the Plough in Huddlesford, we got a taxi to Lichfield Trent Valley and a train back to Nuneaton and the car home. 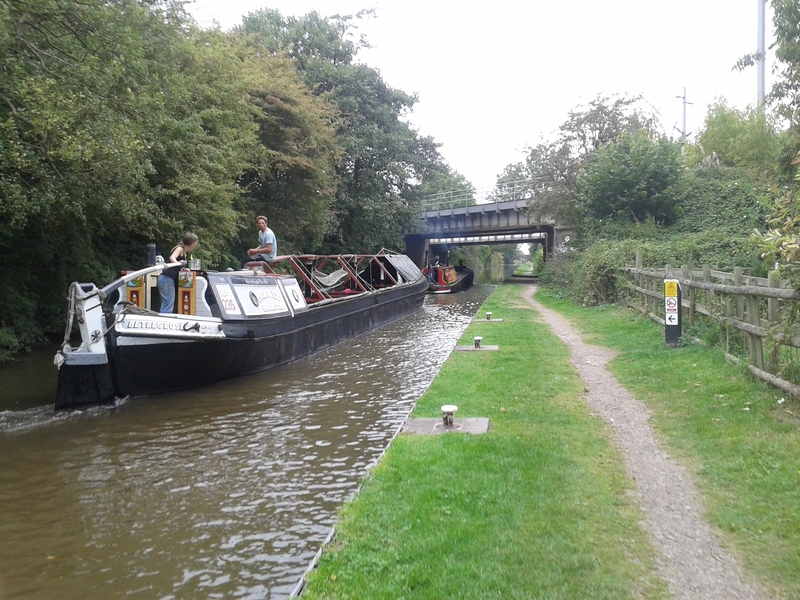 A great weekend, and a big thanks to Jason and Charlotte for inviting us on their first trip – we wish them well with the further work they have planned on the boat and hope we get a chance to give them a tow with Willow one day! 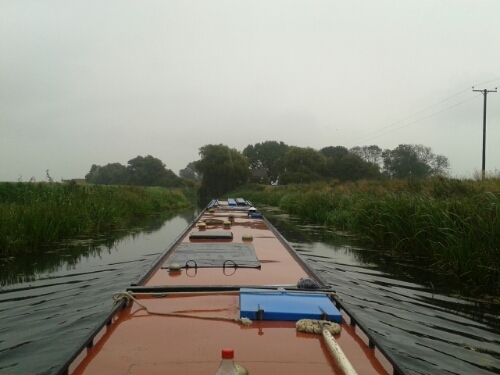 We had a fantastic summer trip, and when we got back we plugged it all into CanalPlan to work out how far we’d gone. The home stretch. 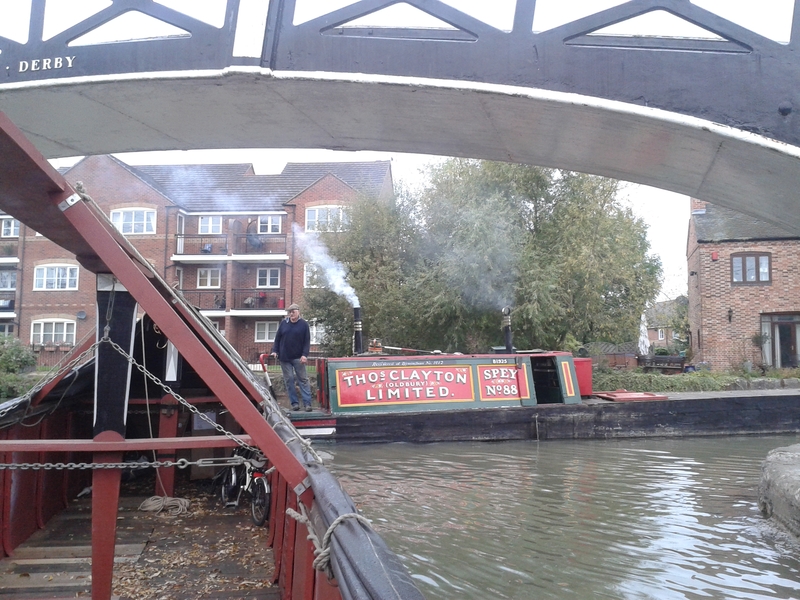 We set off at just before 9 and made good time, with both locks in our favour we were in Cambridge by 1pm. We were particularly pleased to find that our old spot was still vacant. 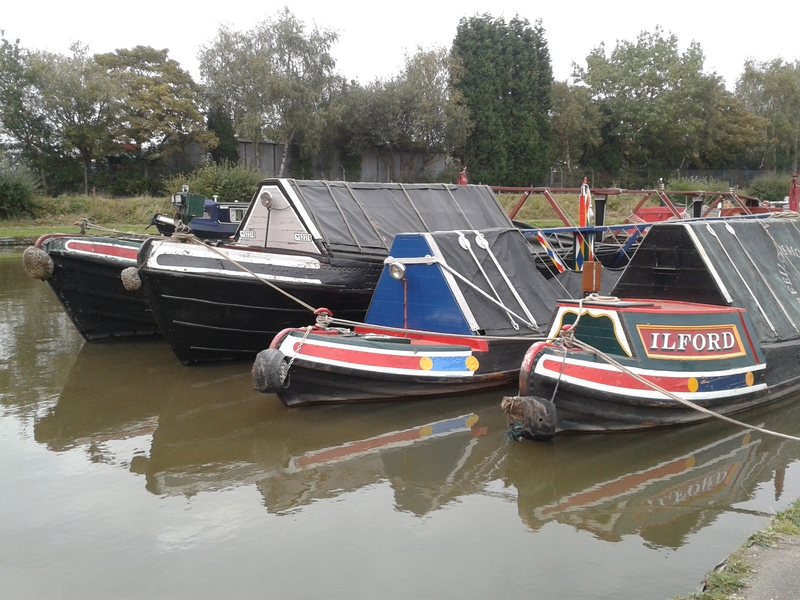 Our mooring licence only gives us the right to moor somewhere along the public green spaces so we don’t have a designated spot but simply one space that we have taken a liking to! Thankfully whilst we were away no one had taken it so we were able to slip in between nb Bümba (previously nb Light Enough to Travel) and nb Suzi Q. The low tide at Salter’s was at 11:45 so it was a late start. It was Paul the lock keeper’s birthday so although he was about because he lives next to the lock it was a relief lockie who worked us through. It was a very low tide so we had to wait outside the lock on the mud for a while before it was deep enough to go through to Denver. But once there the lock was open ready for us. 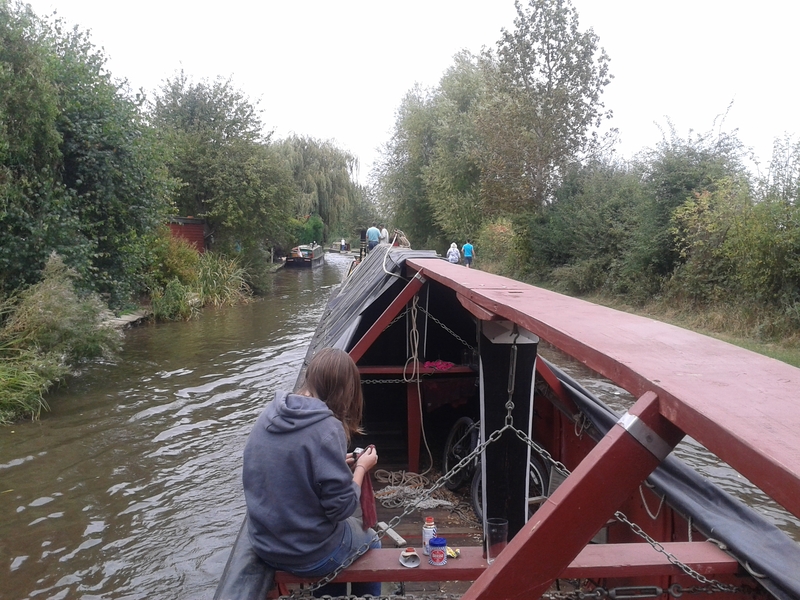 We made good progress up to Ely -the river is wide and deep, tying up on the park moorings and going to see a friend for a game of Settlers of Catan followed by a drink at the lovely Liberty Belle micro pub, owned by the same people who run the Lynn Union trip boat. There wasn’t any Internet signal on the moorings hence the very late post! Today we’re going home…. It was a lovely sunny day, quite a contrast to yesterday’s drizzle, making the trip much more enjoyable. 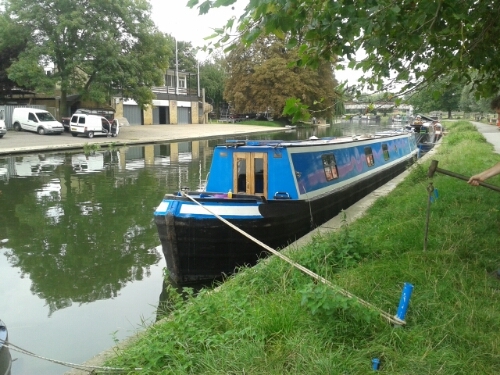 We stopped on the moorings just below the Library in March to swap some library books, then carried on. 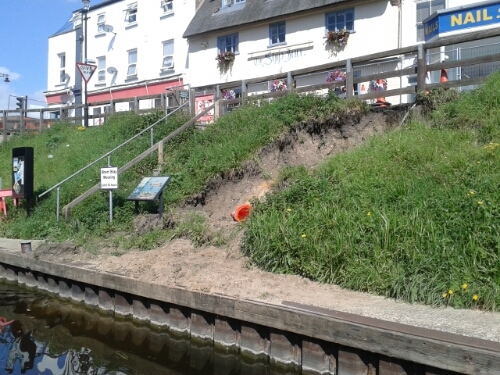 The main town moorings are closed due to a recent land slip. Boats have taken to tying up opposite instead. 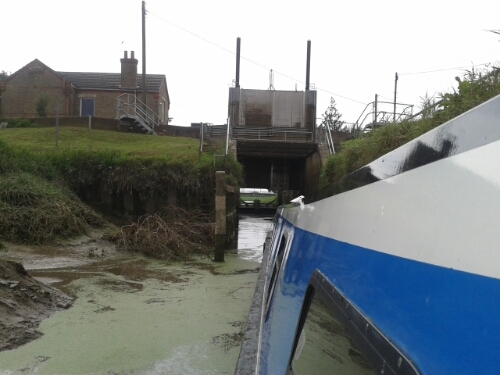 Then it was out along the old course of the Nene to join Well Creek and go through the lock at Marmont Priory. The twin villages of Upwell and Outwell looked lovely and we stopped for lunch by the church staithe in Upwell. The moorings there have been planted with all kinds if useful edible things: rhubarb, raspberry canes, strawberries, and a herb garden as well as flowers and roses in memory of members of the Well Creek Trust who care for the staithe. Well worth a stop. 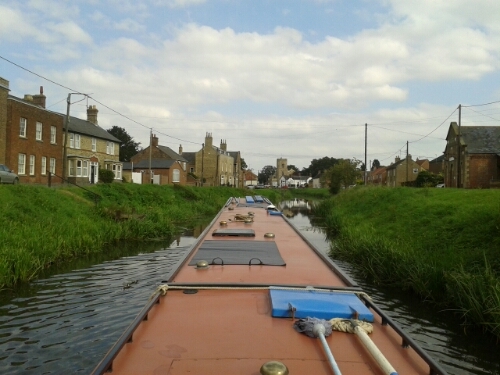 However we wanted to reach Salter’s Lode today so we’d be ready to go through tomorrow and so we didn’t stay long at Upwell. 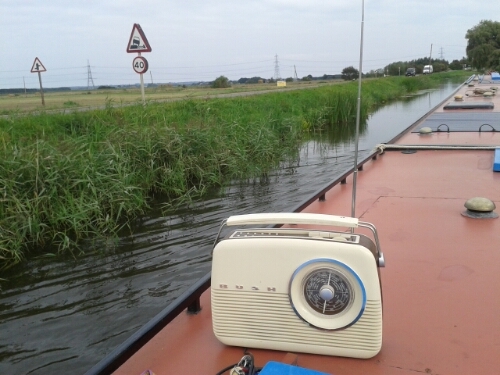 The last few miles from the villages to Salter’s are always a slog but the dry weather meant we could plug in the radio which was a great improvement! 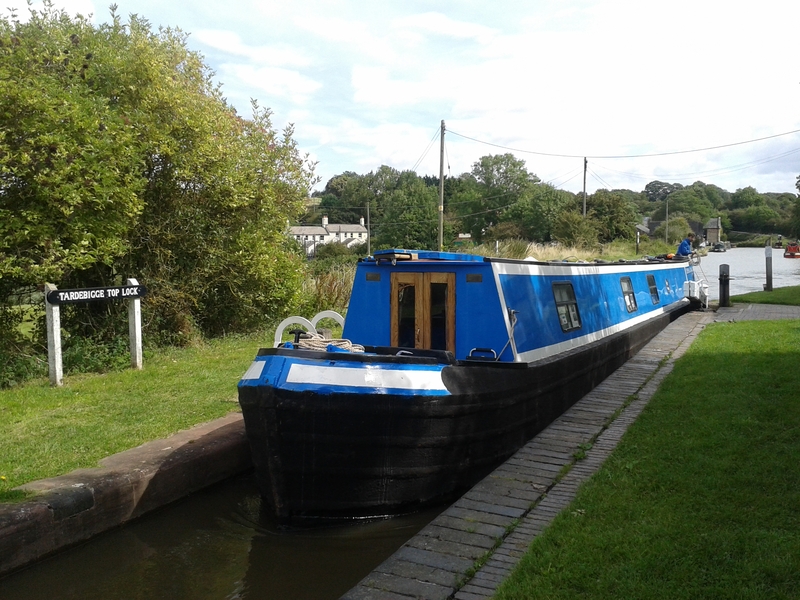 We were booked through Stanground Lock at 1pm today. I’d spoken to Tina and let her know that we’d need the levels raising to get through. When the relief lockie had let us through last Easter he’d not been able to do this so we’d had to go in backwards and stern haul. 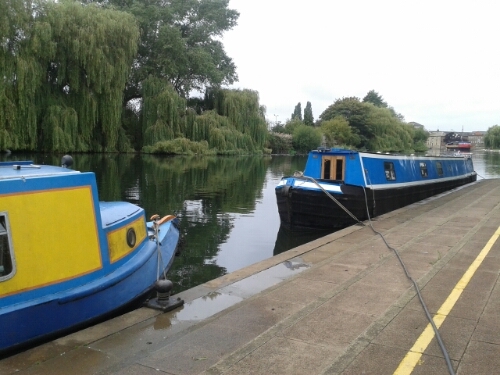 We arrived in Peterborough at about 11am, and stopped at the water point where we met the new owner of a boat, Barkley, which had been in Cambridge for years and is on its way to London. I called Tina to see if there was any possibility of coming through earlier and she agreed to let us through. With the level raised and by sitting in the middle of the lock where it’s deepest we were through quickly. Brigatte bend posed no problems then it was the long chug to March, in persistent drizzle. 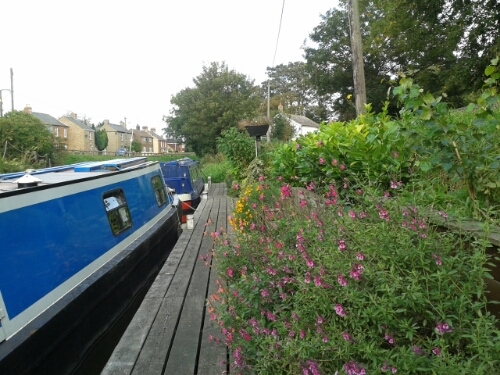 We’re now at Fox’s marina having paid £7.50 for the security of a guaranteed mooring! 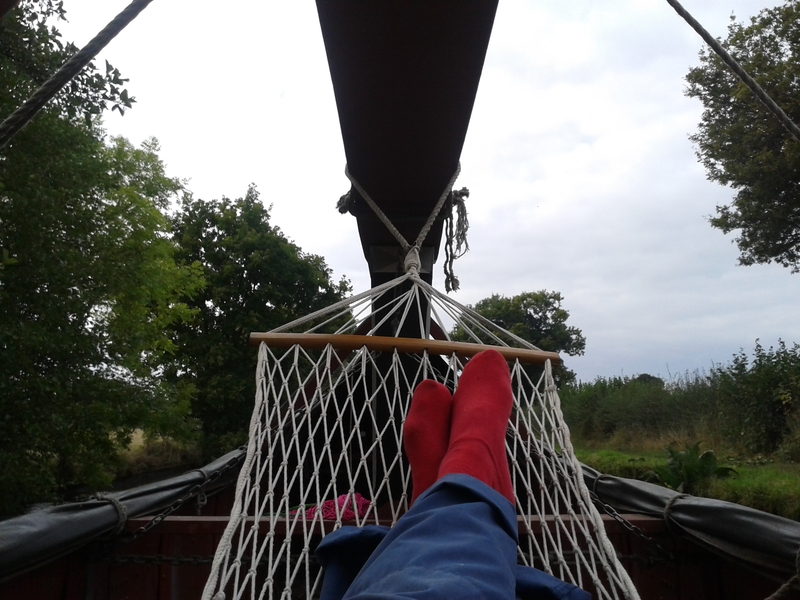 The tide at Salter’s Lode is too early for us to make it tomorrow so we’ll be back on the Ouse on Wednesday.